Are you planning a season’s wedding? Do you wish to drive your guests overboard with the imagination of a colorful autumn wedding? Are you eyeing a winter wedding? 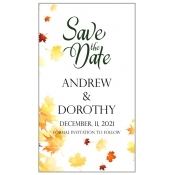 Perhaps it is the perfect time you should warm up to the idea of actualizing your dream wedding starting with these seasons theme wedding magnets. 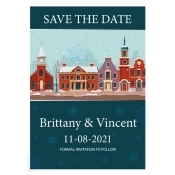 These wedding save the date magnets are perfect to set the tone for your impending seasonal wedding. They will prepare your guests to enjoy the day in full spirit. 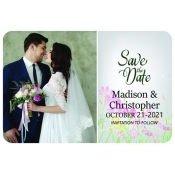 We offer the best price and highest margin of discount on bulk orders with these wedding save the date magnets. Seasons theme weddings are getting popular because people find them extremely romantic and natural to the core. Many times themes of a seasonal wedding, beach wedding, garden wedding and destination wedding may overlap due to their interconnecting factors. 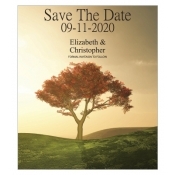 We help couples to set out the straight theme for their wedding through these pre-wedding invites. People cannot help falling in love with- seasonal themes and they will retain these customized magnets over their refrigerator doors and other visible ferrous places within the home. Seasonal wedding is not an easy affair and it requires additional attention than the regular stereotypical church weddings. Many times the costs may go overboard due to the choice of venue, floral arrangements, decorations, food, drinks and other details. However, invitations are the only area where the couple can eye some savings. 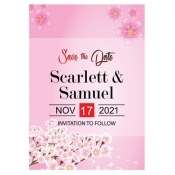 They can easily match their ideas of seasonal theme with their budget by availing any of our customized save the date magnets offered in this selection. The current selection only features best-selling wedding magnets which are crafted on popular sizes of rectangle and square magnets. If you feel that they lack any character, feel free to position information over oval magnets, circle magnets, custom die cut magnets and custom shaped magnets. It does not matter to us whether you wish to get married in fall/autumn, winter and summer because we are always ready to help in setting the correct tone for the occasion. You can approach us with your designs or share your thoughts with our team who will help to set the mood for the event. If you already possess an artwork, feel free to share it with us at art@CMagnets.com or upload at the end of the ordering page. We offer a large selection of envelopes which can be customized to match the flavors and favors of your wedding theme (at additional costs). Avail free art setup, free online design proof and free shipping anywhere within the contiguous USA.